Ahem. Has it really been almost three months since I posted? I believe it has been. I have a good excuse, though! For the last three months, I've been living with and helping out a small Australian family transplanted to rural Tennessee. It was my first trip to the Northern Hemisphere, and quite an adventure. 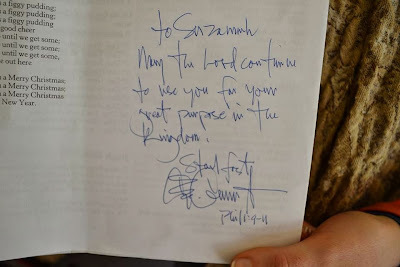 I got the autograph of a hero of mine--Dr George Grant. I attended the NCFIC's Worship of God conference--and strongly recommend everyone to go get themselves the mp3s of that, although common consensus appears to recommend not bothering with, ahem, certain parts of the panel discussions! I met a fellow bibliophile, writer, and book blogger whom I've had the privilege of working with over the last year, Schuyler of My Lady Bibliophile. I made the acquaintance of many wonderful people--and also of pneumonia. I also came home with some new ideas for where I can be taking Vintage Novels in the future--which I'm looking forward to working on in the New Year. I hope to be back as soon as possible with more posts on the books you love--and till then, Merry Christmas! 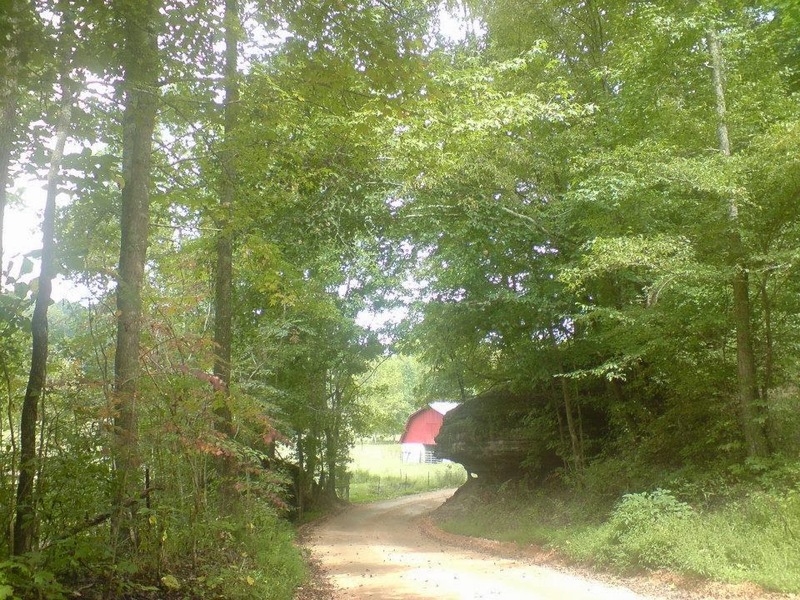 This week's post comes from another guest and a very old friend, Joshua Grubb. I was excited when Josh offered to review Les Miserables for Vintage Novels--partly because I'd already read the book, but didn't remember it clearly enough for a review--and partly because I knew Josh would do a fantastic job of digging into the book's deeper themes. I so enjoyed reading his review, and hope you will be just as interested and edified as me! 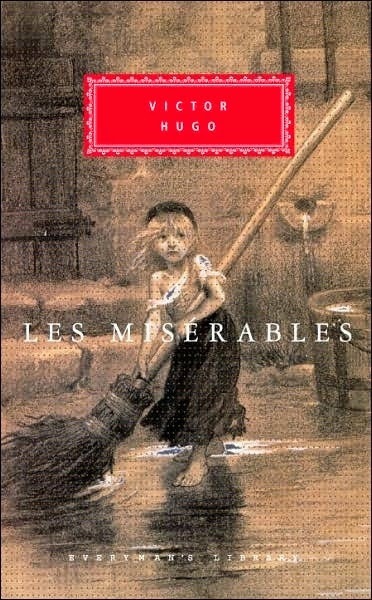 Les Misérables: How miserable can you get? 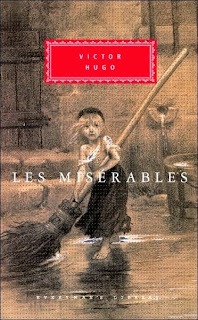 Les Misérables (by translation, the unfortunates or miserable ones), was published in 1862 – after the French Revolution, the fall of Napoleon and the 1832 and 1848 revolutions. It tells the story of several ‘misérables,’ brought or kept in a low station by “a social condemnation, which… complicates [with human fatality] a destiny that is divine.” However, before discussing the ‘social condemnations’ and the ideas in this quote, a summary of the story would be in order. The book moves slowly at first, detailing the life and circumstances (in some detail) of M. Myriel, a philanthropic bishop, who aids Jean Valjean to escape ‘justice.’ Jean Valjean is a convict sentenced to the galleys on the evidence of the implacable police inspector Javert, who thinks he has stolen apples. Partly through the bishop’s help, Jean Valjean escapes the galleys and establishes quite a lucrative business by inventing a new, cheap method of making jet. Through his prosperity, he promotes the wellbeing of other ‘unfortunates’ in the region around his factory by providing well-paid jobs and through charity. One person that does not prosper, however, is Fantine, who is brought to prostitution in an attempt to provide for her daughter, Cosette. Cosette is being ‘cared’ for by the despicable Thénardiers (a family with two daughters and three sons, one of whom is called Gavroche), who cheat Fantine of her money and treat Cosette as a slave. However, Jean Valjean promises Fantine on her deathbed to care for Cosette. Before he can fulfil his promise, Jean Valjean is hunted out by Javert and is forced to leave his business, though he escapes justice and retires in seclusion on a fortune of six hundred thousand francs. While escaping, he manages to rescue Cosette from the Thénardiers and brings her up in comparative luxury. The next character to appear on the scene is Marius, a young man with revolutionary sympathies. In 1884 an English schoolmaster named Edwin Abbott Abbott (or A ^ 2) wrote a novella exploring various concepts of geometry and mathematics, whose hero, a Square inhabiting a two-dimensional world, through a series of visions and visitations, comes to discover the secret the oppressive masters of Flatland have been concealing for centuries: the existence of a three-dimensional world. Flatland is, in many ways, delightful. Abbott exercises wit and imagination to depict what it would be like to live in one two, three, or no dimensions--and what it would be like for an inhabitant of one to visit another. I learned quite a bit. But in addition to being a mathematical story with plenty of insight on geometry, it's also a rather pointed satire. Some of it is quite funny. The King and sole inhabitant of Pointland is unable to imagine anything in the cosmos except himself, and when the Sphere from Spaceland descends from outside Flatland to enlighten our hero to the existence and wonders of Spaceland, and the humble Square (finally acknowledging the existence of a third dimension) posits the existence of a fourth, fifth, sixth, and infinite additional dimensions, the Sphere immediately disapproves. There is also much political and social commentary, surprisingly for such a short book on such an esoteric subject. 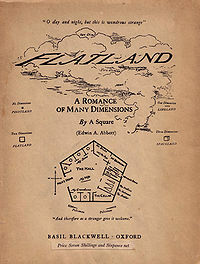 Flatland is only a very short and amusing read, full of geometry and irony, as well as being a classic of science fiction. I enjoyed it. This week's post is from a dear friend of mine and fellow bookworm, Schuyler of My Lady Bibliophile. I asked Schuyler to write on a topic she addressed a few months ago on her blog, only not to pull her punches this time. I loved what she sent me and have great pleasure in presenting this knockout of a post on fiction and dominion! Most of us, if we were asked about our reading, would relegate it to the category of a favorite hobby--something we do after we clock out from our real work, when the kids are in bed and it's almost time to go to sleep ourselves. It's not important, we say, or particularly earth-shattering. It's just something we've always enjoyed--no different than gardening, or putting old cars together, or collecting stamps. Those who blog about books obviously take their love a little more seriously. But in all the conversations I've had with fellow bibliophiles, I haven't met one who calls their reading a mission--a vital part of their calling a Christian, and an indispensable activity that they would never dare to call trivial. A hobby implies that the activity in question can be dispensed with, and for bibliophiles, reading should be anything but dispensable. With every book-lover I have met, there is one prevailing obstacle that prevents us from acknowledging that books are vitally important to us. It is a false understanding of passionate dominion. This dangerous idea that we suffer from began just after the 1500 and 1600s, when the Church went through a sweeping era of Reformation. To counteract great transformation, the Devil often brings an equally prevailing error to infiltrate the Church. The counteract, of course, in this case, was the Age of Enlightenment. During this era, famous philosophers taught the ideas of religious tolerance, man-centered science, and skepticism of the unseen world. Committed Christians reject religious tolerance and man-centered science. But even the conservative Church swallowed the Enlightened definition of realism. And this taught us that passion was foolhardy--hard-headed observation of the world around us was much better. Zeal was for children; rational adults moved into the hard-headed, emotionless, 'common sense' realm of industry and making a living. We're left, of course, with a guilty idea that we mustn't take anything in our lives too seriously, unless it's the daily grind of putting food in our mouths; certainly not curling up with a novel. And as making a living replaced dominion, so reading is no longer a vital activity, but an idle entertainment. Today, non-readers scoff that reading, especially reading fiction, is a waste of any good Christian's time. So bibliophiles live a passionless life. 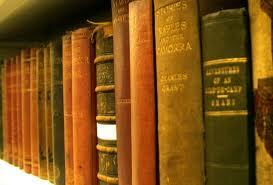 Books are dispensable, stories are just that--stories. In the grand scheme of things, 'real' life is way better than anything we can find between the pages of a good novel. And lack of passion is the biggest obstacle holding back bibliophiles from taking dominion for the Kingdom of God. Dominion requires passion. Not just an acknowledgement that literature can occasionally be useful: but an out and out abandon in preaching its merits and its uses. If something is worth doing, then we must do it with all our heart and soul, and if we're truly committed to being Christ-honoring readers, we need to realize that much more is at stake than wiling away a half-hour with a good yarn. Until we acknowledge that reading is a vital part of the Christian life, and one worthy of excitement, dominion falls pretty flat. The written word is powerful; some say it has triple the power of the spoken word. Certainly it lasts longer than any conversation, and therefore its potential for good or evil is that much greater. A novel is not merely a novel; a biography is not merely a biography; a book is a powerful unit of worldview indoctrination that will last far beyond an author's lifetime. Think about it: a man can get up and give a speech; half the audience will remember it for a few weeks, and then it will be forgotten. A man can turn that same speech into a book, and adults will still be reading it centuries later. I might add as well, that a man can turn the principles from that speech into a story, and entire families will be repeating it until the end of time. Clearly books have power. And if they have power, we should take dominion of that power for the Kingdom of God. Reading is so much more than putting words together. It's intellectual stimulation, the preserving of doctrine in lasting form, and a battlefield between God and the Devil for the minds of human beings. When you put it in perspective like that, reading should require a lot more than casual interest on our part. When we immerse ourselves into our favorite stories with infectious enthusiasm, we're abolishing two major strongholds: first, we're showing others that there is no such thing as a small issue in God's Kingdom; second, we're showing the world that literature is a living, breathing gift from our Lord. Scripture, the very word of God, is a compilation of documents that shows us He takes a strong delight in the things that we have relegated to mere entertainment. Beautiful love poems, tales of conquering warriors, nations rising and falling, and mothers and fathers raising their families are all part of the Word, and were used as powerful teaching tools. Kidnappings and slavery, shipwrecks and runaways, every theme we find in man's literature, we find first in the Book of Books, wrapped up in God's plan of redemption for mankind. Why get excited about books? After all, aren't they just a reflection of God's writing in His Book? Yes, and that's the exciting thing! We're called to be mini-Christs, imitators of God, and communicators for his Kingdom. He has graciously allowed us to participate in His dominion, and bibliophiles are given the special mission of taking dominion through the written word. If our calling is to teach and reform in the area of literature, then we need to have zeal in doing so. Not the fan-girly kind. I'm talking about the earnest kind. A swift and earnest intensity that loves what God loves and hates what he hates, and realizes that if we are using our precious time to advance His Kingdom, than truth is at stake in every book review we write. Romans 12:11 says "Not slothful in business; fervent in spirit; serving the Lord." We are to be fervent, 'boiling over in spirit' about the business God has called us to--in this instance, the business of reading--having a mindset that in our book lists and recommendations, we are serving the Lord, not only with the reading we do, but also with the intensity in which we do it. It is not wrong to have strong feelings about books. Nor is it wrong to get excited over them. When we refuse to have strong feelings in the first place, we miss so much joy and beauty that God wants us to partake in. Why do we have such a hard time throwing ourselves with passion into anything? Perhaps because, when we give way to zeal, to absolute abandoned commitment, then we lose control, and since the foundation of the world we have succumbed to the idea that man controls. Zeal and passion are forces so potent that they are beyond our ability to handle; and therefore, we must put them straight into the hands of Almighty God. Certainly the excitement of reading itself is not the end goal. If we are to take passionate dominion, we must read what will best equip us to be more like Christ. The goal of dominion, after all, is to take something and make it obedient to the standards of God. This also means we read fiction passionately as well as nonfiction. 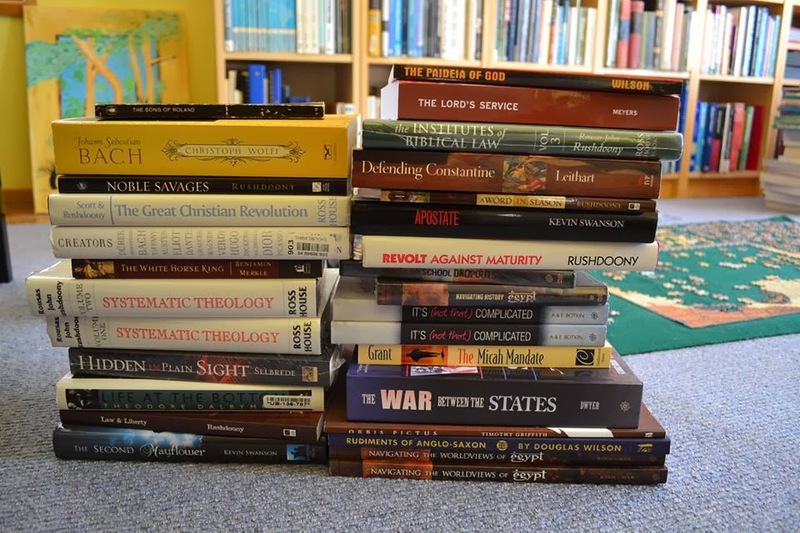 The joys of fiction are often considered illicit ones by the Church at large, and it's an area of misunderstanding that needs some serious re-building to arrive at a biblical understanding of it. Even stories affect souls, teach worldviews, and shape minds. Those who consider fiction 'non-essential', or 'alternate reality' desert the field of battle and hand the victory straight to the Devil. Satan and his minions love to use the tools we leave for them. God isn't honored by indifference. If we view one area of our lives as less valuable than another, we clearly need a different perspective on what living for Him really means. The sacred and secular divide is sucking out the life of the Church, and turning out a generation of young people who lack vision for the grand adventure the Christian live really is. We need a generation of confident bibliophiles, who recognize and value the love of good literature inside them. To have a zeal for something, we have to go out on a limb with it; to go against all the indifference that has infiltrated our cautious, reserved, and complacent blocks of pews, and show that God is just as anxious to have books conformed to His glory as he is any other area of life. As a Christian, our goal is to read books that are good, with the kind of goodness that originates from God. But we are not to hold books loosely--to be afraid they will call us away from the Father. We are to be irrevocably attached to every good thing that He sends us. This is not idolatry. This is a fellowship with God that loves what He loves, abhors that which is evil, and irrevocably clings to good. Books are not a playground; they're a battlefield. Reading is a vital exercise--it's the key that unlocks the gateway to the intellect, and that's a weighty door to open. Only the greatest excitement, the greatest commitment, the highest enthusiasm will enable us to accomplish such a glorious mission of taking it back for the glory of God. Many thanks to Suzannah for hosting me today, and letting me talk about my favorite subject: the written word. :) Literature has always been a passion of mine from a young age, and I talk about it every chance I get. I hope this post has inspired fellow book-lovers to take their interest in reading even more seriously, and love books even better than before. -Schuyler McConkey, My Lady Bibliophile. In 1858, a young Scotsman left his beloved family and thriving city mission to travel with his bride to the other side of the world. The cannibal islands of the New Hebrides, known today as Vanuatu, were among the most dangerous missionary destinations in the world: just twenty years prior, in 1839, two missionaries landed on the island of Erromanga had been clubbed to death, cooked, and eaten as soon as they reached the shore. Warned that he would be eaten by cannibals, Paton--with the calm audacity that characterised him--responded that his interlocuter would undoubtedly be one day eaten by worms, and what difference did it make? The Patons settled on the island of Tanna. Within the first few months, Mrs Paton and their newborn child had died of fever. By the end of four years, the natives had determined to kill their missionary and drive the worship of Jehovah out of their land, blaming Paton for bad weather and illness. On Erromanga, a missionary couple were murdered and natives from that island travelled to Tanna to stir up the natives there to similar deeds. After a year of constant vigilance and many close shaves, Paton finally escaped with his life, in the company of two other missionaries whose health was so ruined by their experiences that they died within months. Paton, however, went to Australia and Scotland to raise support and money for a mission ship, the Dayspring. In 1866, Paton returned to the New Hebrides with his second wife and settled on the smaller island of Aniwa, where in a few years he led the entire population to profess Christianity. They also began to wear clothes, observe the Lord's Day, and entirely cease from killing, strangling, and eating one another. The name of John G Paton is not often remembered or recognised. Christians who grew up on short popular biographies of David Livingstone, or Mary Slessor, or Hudson Taylor, or occasionally even George Muller or Adoniram Judson, have often never heard of Paton. 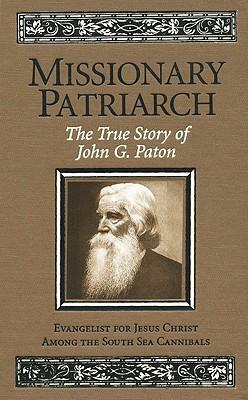 In recent years, since the reprinting of his once-famous Autobiography by Vision Forum under the title Missionary Patriarch: The True Story of John G Paton, some Americans have made his acquaintance. I, however, heard of him as a young teen when my parents joined the Presbyterian Church of Victoria, of which he was a member for much of his life, and which still keeps an echo of his legacy alive. The PCV Sunday School mission periodical, for instance, was called Dayspringers in his honour, and many years ago I read a child’s biography of Paton, King of the Cannibals, by a local minister, Jim Cromarty. My interest in Paton was revived when I was involved in organising the Australian Building a God-Centered Family conferences with Scott Brown and Kevin Swanson. We were keen to show these men around some notable historical sights in Melbourne, especially from a Christian perspective. Being a young country, however, Australia has precious few John Knoxes or Alfred the Greats to honour, and we racked our minds in vain. 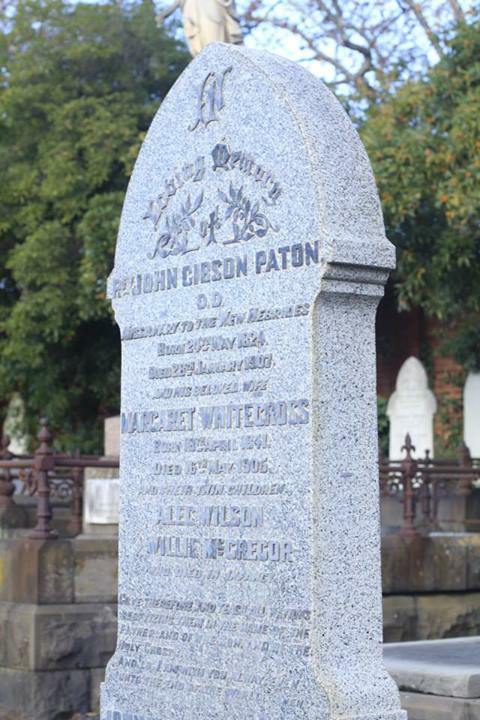 Then I remembered--wasn't John G Paton buried in Melbourne? Sure enough, his grave is in Kew, in the Boroondara cemetary (corner of High Street and Park Hill Road). Our guests were even more thrilled than we expected, and you can watch their excited speeches at Scott Brown's website here. Suffice it to say that after having witnessed their excitement, and listened to John Piper's excellent talk, You Will Be Eaten By Cannibals! Lessons From the Life of John G Paton I decided I really should buy the autobiography. It is a magnificent book. Paton writes engagingly and well. His hair-raising adventures--both in the New Hebrides and in the more "civilised" lands of Scotland and Australia--drag you in, often with white-knuckle tension. His later account of the evangelisation and transformation of the Aniwan cannibals is thrilling in a different, more uplifting way. Meanwhile his personality shines through saintly and kind, but uncompromisingly, tenaciously courageous with an added helping of what can only be called cheek. From his short way dealing with bullies as a young schoolmaster to the many occasions on which, having just foiled an attack on his life in the Cannibal Islands, he lay down and enjoyed the sound sleep of the righteous, Paton shows a delightful pluck, or moxie, as John Piper calls it! The tribute Paton pays to his godly father is worth the price of the Autobiography, even if you don't read anything else. Maybe it's because I have a daughter and four sons, but I wept as I read this section, it filled me with such longing to be a father like this. While this is not the major focus of the book, Paton also left an impressive family legacy behind him. By the end of the Autobiography he mentions a "Mr Frank H L Paton" settled in mission work on Tanna; too modest, perhaps, to mention that this was his third son. Paton had ten children and many grandchildren, most of whom settled in Australia. 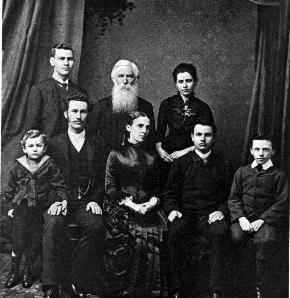 Among his children and grandchildren are numbered 7 ministers, 4 ministers' wives, 1 Moderator of the Presbyterian Church of Victoria, missionaries into the second and third generations, 1 or 2 medical doctors, a Vice-Chancellor of Melbourne University, and an influence reaching from my little rural home town to Canada and Korea. 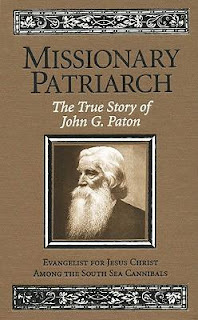 In the Publisher's Introduction to my beautiful Vision Forum hardcover edition of John G Paton's Autobiography, it is called "the greatest missionary story ever written." I could not say whether this is true. But it's the best I have ever read. Last year I reviewed the cartoon adventures of Tintin. Back in the day, when no trip to the library was complete without raiding the comic book section, it was not just Tintin books that we were after. It was always Tintin and Asterix, and the two are still oddly inseparable to my memory. Back then, this was probably an accident of shelving. It was not so much the comic-book section: it was the Tintin-and-Asterix section, or, on odd-numbered days of the month, the Asterix-and-Tintin section. With the passing of years, I began to notice other similarities. Both series were originally written in French (one by a Belgian and the other by Frenchmen), for example. Both series featured the global adventures of a diminutive, yet invincible hero with his larger and more boisterous companion, and were accompanied by a little white dog. Asterix the Gaul is so many, many things. Let me try to stab at it. 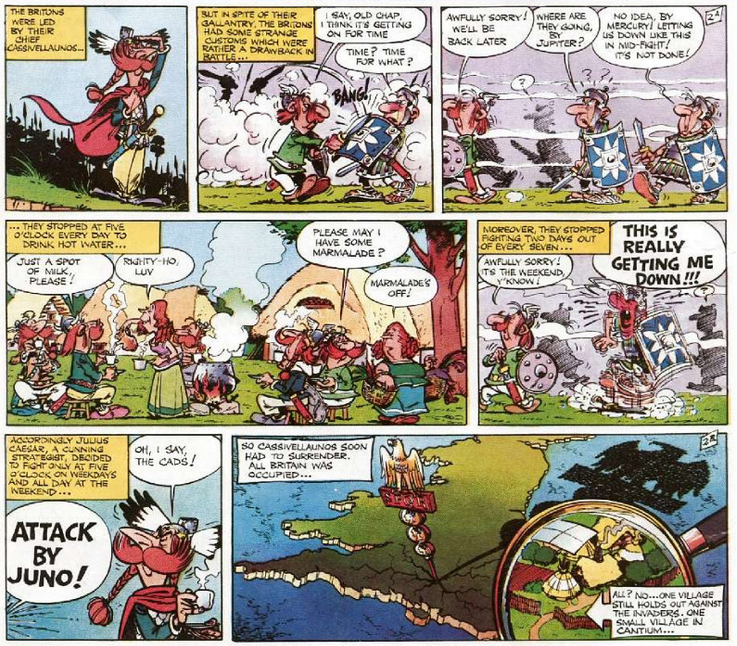 First, it's the thrilling adventures of Asterix, the smallest and by far the cleverest and sanest (with the possible exception of Getafix the Druid) of "the little village we know so well"--or, as the Romans call it with a shudder, "that village of madmen." The village, full of colourful characters (from Cacofonix, the village bard who sings so badly that he has occasionally been used as a weapon, to the perpetually squabbling Fulliautomatix [blacksmith] and Unhygienix [fishmonger]) remains free from the Roman yoke only through the cunning and daring of Asterix, and the magic potion brewed by the druid Getafix, which makes the drinker invincible. 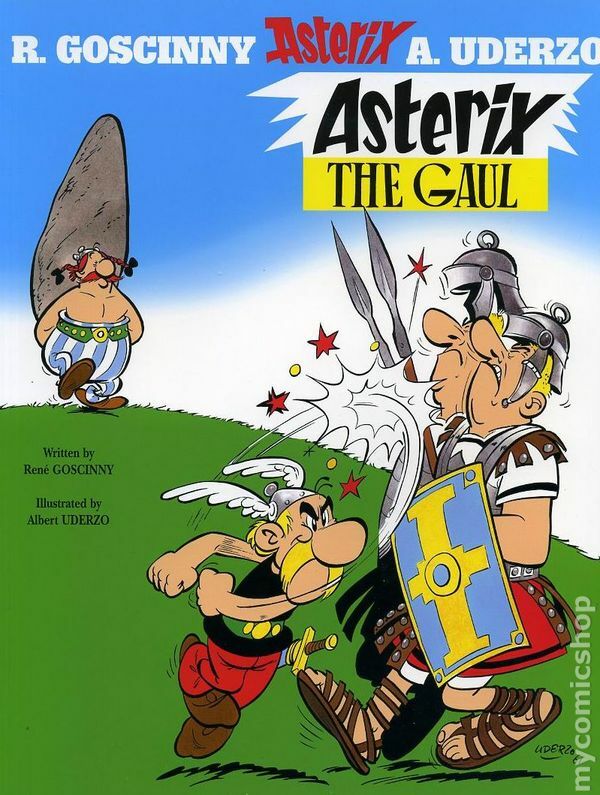 In English, Asterix the Gaul is one of the most remarkable translations the world has ever known, right up there with the Authorised Version of the Bible. The sublime Anthea Bell and Derek Hockridge had the unenviable task of translating around 50 pages per album from French into English--pages packed with every kind of pun, many with visual cues in the pictures. Faced with this task, Bell and Hockridge simply decided to count up the number of jokes and puns on the page and try to make sure the translation included the same number, not necessarily present in the original (indeed, many were entirely untranslatable). For just one small example, the name of the village bard in the original version is "Assurancetourix", a pun on Assurances tous risques, all-risk insurance. In English, it's Cacofonix, even more apropos to the bard's ghastly music. 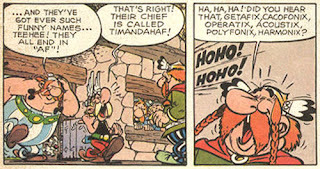 Finally, Asterix comes packed full of information, satire, and jokes. 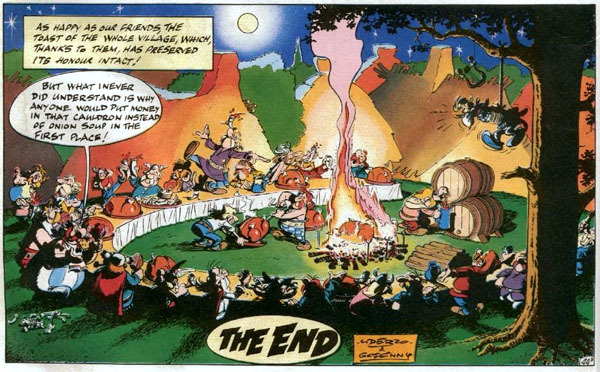 I like to say that I learned half of what I know from Asterix (the other half, I learned from PG Wodehouse). The volume I have sitting on my desk, for instance, Asterix the Legionary, follows Asterix and Obelix to Africa during Julius Caesar's campaign against Scipio (real historical background). We get a look at Roman military tactics ("Hey, isn't this Caesar's tortoise?"). There's a hilarious parody of Gericault's painting The Raft of the Medusa on page 35 ("We've been framed, by Jericho!"). There's fun with national stereotypes (a Briton who loves terrible cooking, a Belgian with a suspiciously Tintinesque hairdo, an Egyptian who speaks only in hieroglyphics). There's satire of bureaucracy and the military ("Where do I find the information bureau, please?" - "No idea. Apply to the information bureau. They'll inform you.") There's a Gaulish spy, Vitriolix, codenamed H2SO4. And there are tons of Latin tags ("Alea jacta est, as I always say"). And that's just one volume. 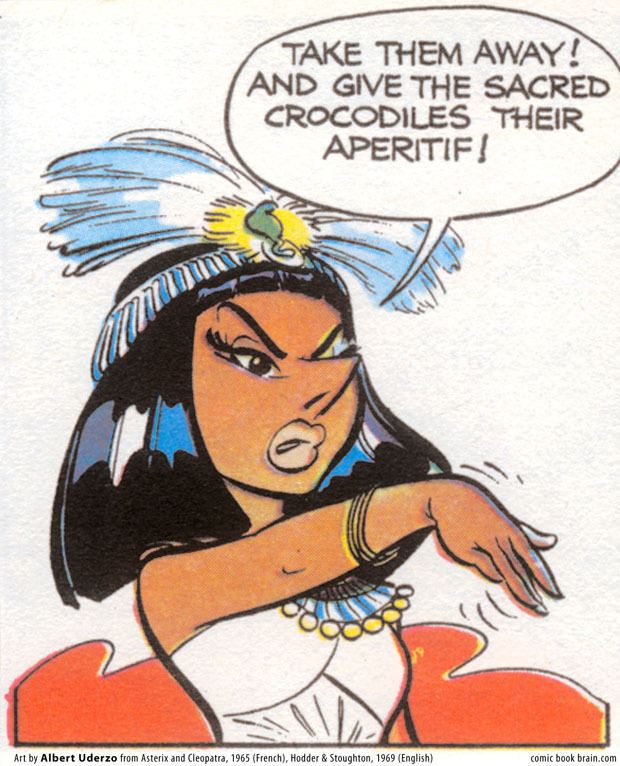 Cleopatra, on a typical day. 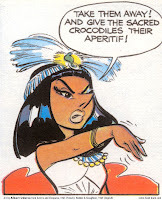 Asterix and Cleopatra is undoubtedly one of the greatest Asterix books of them all. Stung by Caesar's comment that the Egyptians have become decadent, Cleopatra bets Caesar she can build him a magnificent palace within three months. This is not good news for Edifis the architect, who will be fed to the crocodiles if he fails. Fortunately, he's an old friend of Getafix the druid, who decides to travel to Egypt with Asterix and Obelix to help. Asterix the Legionary: Obelix falls in love with Panacea, a local girl just returned from studying at Condatum--but is heartbroken to discover that she has a fiance recently drafted into Caesar's army and sent to Africa. Obelix and Asterix vow to bring Tragicomix back, and join the Roman army in order to do so. I'm not sure why this is one of my favourite Asterix books of them all; I came to it late, and it knocked me into stitches for a week. Obelix and Co. The Romans, constantly trying to come up with ways to conquer the Gauls, decide to try the most lethal weapon yet: capitalism. 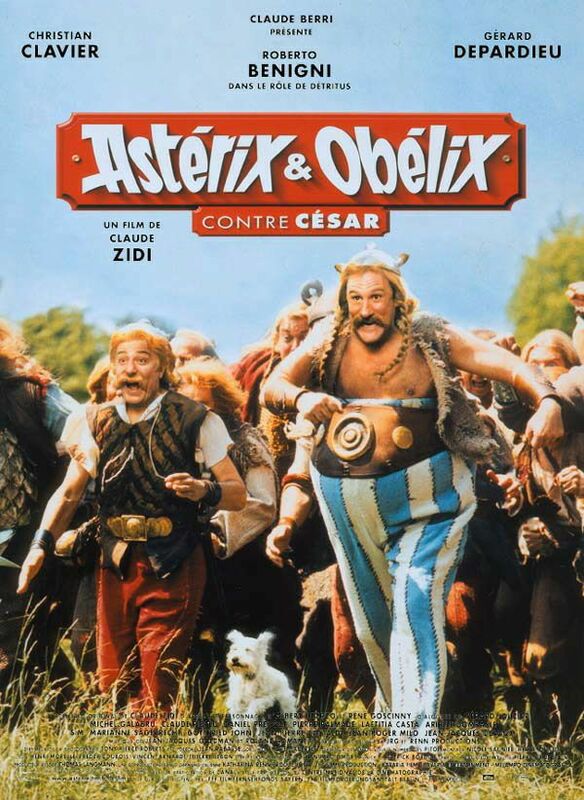 Roman economist Preposterus starts buying Obelix's menhirs at ever-inflating prices, causing the other Gauls in the village to go into competition with him. Preposterus and Caesar manipulate the Roman economy, and the menhir bubble floats for a while. This 1976 book is a fantastic economics lesson, and, believe it or not, a critique of Jacques Chirac, a recent president of France, who served as the model for Preposterus. There are plenty of things to love about Asterix. I still find the books as hilarious as I did as a child. These days, I particularly enjoy what the books capture about small village life and the way even the best friends can get on one's nerves occasionally. I've always loved the punning names in Asterix. All the Gauls have names ending in -ix, the Britons in -ax ("Selectivemploymentax, I say, what! "), the Romans in -us (from Nefarius Purpus to Crismus Bonus), the Egyptians in -is or -et (Edifis, Artifis, and Ptenisnet), and the women in -a (Impedimenta, Bicarbonateofsoda). This said, there is a certain drawback to all this fun. 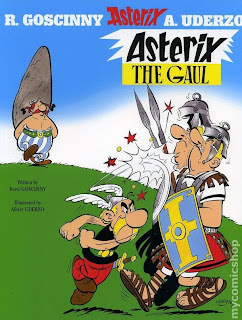 A friend of mine, reading the book Asterix appears to be loosely based upon--Caesar's Gallic Wars--decided it would be fun to read it to his family. Unfortunately his mother, a lifelong Asterix fan, lost her composure entirely at the first-paragraph mention of the historical Gaulish chieftain Vercingetorix. And that was it for the Gallic Wars. But if you ask us, much better to stick with Asterix. JRR Tolkien, having shot into well-deserved fame for his Lord of the Rings and even, by now, The Hobbit, continues to baffle publishers. On the one hand, it is their benevolent and entrepreneurial duty to introduce as much of the reading public to as many of this great man's works as possible. 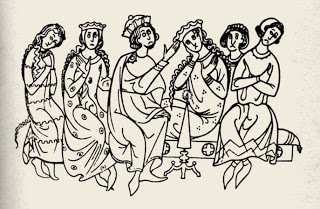 On the other hand, how does one drum up a perfect fever of PR excitement over, shall we say, an unfinished Anglo-Saxon-style alliterative-verse retelling of an almost entirely forgotten legend? (It's true, if somewhat beside the point, that the Vintage Novels blogger is in thrilled about getting a copy of this work someday). Or what about a slim, jolly children's book featuring a rotund farmer, a wily (but easily-tamed) dragon, a handful of sly scholarly jokes, and charming illustrations by Miss Baynes...with not a Hobbit nor an Elf nor an epic and cinematic battle scene in sight? Oh, all right. To those who know of his existence, Farmer Giles is irresistible. Meanwhile the story comes lavishly illustrated by Pauline Baynes, perhaps best known for her iconic Narnia illustrations. 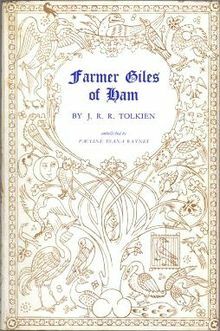 Her Farmer Giles work, however, is quite unique: smooth, flowing line drawings in the style of medieval manuscripts, beautiful in themselves, but brimming with impish humour and adding substantially to the wit and satire of the story (in fact Tolkien famously remarked that they had "reduced [his] text to a commentary on her drawings"). Tolkien's tongue-in-cheek Foreword parodies his fellow scholars by waffling on about the historical significance of the Farmer Giles of Ham manuscript, and then adding as an afterthought that some readers might enjoy the story on its own account. Tolkien's famous essay on Beowulf, "The Monsters and the Critics", argued that scholars should stop mining that poem for historical significance and just enjoy it as the corking good story it is. In explaining what a blunderbuss is, the author of Farmer Giles refers to the Four Wise Clerks of Oxenford for a suspiciously dictionary-type definition. This is a double joke: it refers not only to Geoffrey Chaucer's Clerk of Oxenford, but also to the four editors of the venerable Oxford English Dictionary. The parson of Ham, a learned man, is called "a grammarian, [who] could doubtless see further into the future than others." Tolkien-lovers agree that grammar is a pun on the related words glamour and grimoire, both of which referred to magic in medieval times. The parson also serves for a sly joke at the expense of linguists like Tolkien himself: faced with language he can't read, the parson breaks out into professional-sounding polysyllabics to stall for time. When Chrysophylax strikes a bargain with the village of Ham to return at the feast of St Hilarius and St Felix, the village's pessimistic smith grumps, "Ominous names! ... I don't like the sound of them." Hilarius means happy and Felix means lucky. Naturally, I highly recommend Farmer Giles of Ham to just about anyone. Children will love the story and humour; adults will relish the wit; linguists and Latinists will whoop at the word-play; while Tolkien fans will enjoy the distinctive flavour. Enjoy! 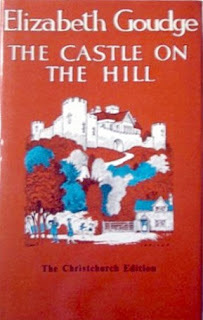 To be honest, I haven't been reading an awful lot of vintage novels lately, which might account for the actual sparseness of vintage novel reviews around here. The fact is that when I want to relax and read something that requires little effort these days, I usually turn to non-fiction. More and more, I put off reading fiction until I'm wide awake and ready to work at reading it. The purpose of fiction is to embody certain truths of human life in a series of imagined facts. The importance of this purpose is scarcely ever appreciated by the casual careless reader of the novels of a season. Although it is commonly believed that such a reader overestimates the weight of works of fiction, the opposite is true––he underestimates it. 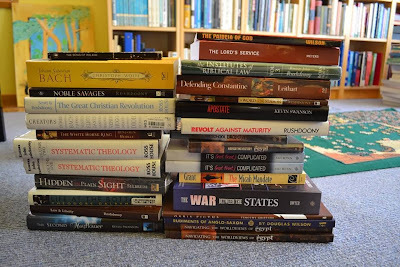 All this aside, I shall certainly be digging into some more vintage books in the upcoming weeks, both non-fiction and fiction. Meanwhile, it occurred to me that I haven't posted a poem in a little while. I want to begin by apologising for the infrequent posts over the last couple of months--I was busy helping organise an international conference, and then recovering from same! It was wonderful to meet some of my readers at the Building a God-Centered Family conference in Melbourne and make the acquaintance of a few new people. And now for the review. Mary Elizabeth Braddon's 1862 novel Lady Audley's Secret is described on Wikipedia as a "sensation novel"; and after stumbling across the title a number of times, I had no difficulty in finding a modern reprint of it in a second-hand bookshop. It was not difficult to see why this specific Victorian novel remains in print. 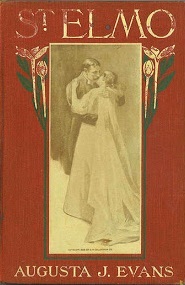 Phrases like "Victorian anxiety", "female motives", and "moral alarm" attend every 2010s reference to the novel. The plot is as follows: Robert Audley welcomes his long-absent friend George Talboys back from Australia, where he fled three years ago to make his fortune. The meeting turns tragic when George goes to find his young wife--and finds only a poor grave. 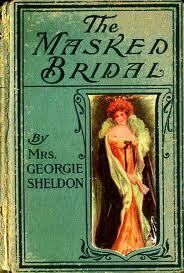 Although a perfectly competent sensational melodrama, I didn't find Lady Audley's Secret a particularly engaging book. It was slow-moving in places; the titular secret was obvious from the beginning apart from a not-that-shocking last-minute revelation which had not been foreshadowed previously; the characters were difficult to like, and the hero seemed rather dense. If anything, the most interesting aspect of the story is the discussion of what it means. Lady Audley's Secret, like many sensational nineteenth-centry novels (The Count of Monte Cristo springs to mind) comes with a thick veneer of technical respectability. Robert Audley starts life as a lazy good-for-nothing who finds a life purpose in bringing justice to his departed friend and even undergoes a mild conversion experience. Lady Audley, as the villainess, descends further into vice in her attempts to keep the titular secret, but suffers the consequences of her actions at last. But in this case, I'm with the feminist literary critics. Not with their perverse insistence on admiring the villainess of this piece because of her unscrupulous self-interest, but with the fact that Lady Audley's Secret is subversive under all that surface respectability. 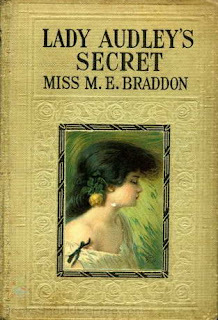 Perhaps most telling is the fact that Lady Audley's Secret was written by a woman concealing a similar secret. Be that as it may, with her flaxen hair and blue eyes, her doll-like beauty and fragility, her appearance of goodness, and her ultimate status as a victim of fates beyond herself, Lady Audley only just misses out on being a Victorian heroine as sweet and melting as Dickens's Esther Summerson. 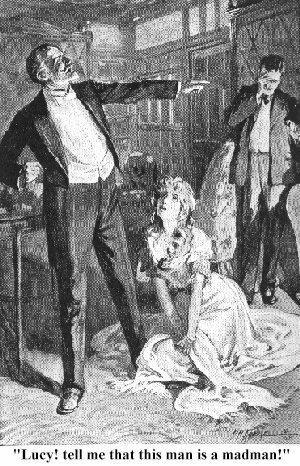 Her portrayal strikes a chord of bitter irony, a parody of the ideal of the Victorian woman as "angel in the house"; it subverts the very idea and expectation of domestic bliss. Sir Philip Sidney has always been remembered as one of the greatest figures of the Elizabethan age, despite the relative humility of his accomplishments and the brevity of his life. As a courtier, statesman, soldier, and poet, he was hard-working and moderately successful, but his continuing reputation seems to lie more in who he was than in what he accomplished. People loved him. 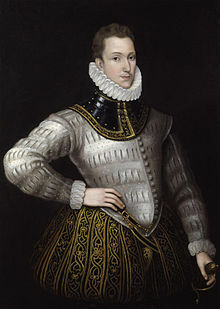 If there was one perfect knight of the Elizabethan court, one Sir Galahad, it was Sir Philip Sidney: sincere in religion, brilliant in intellect, generous and impulsive in battle. During a three-year tour of the Continent in the early 1570s, he was discipled by the Huguenot Hubert Languet and witnessed the St Bartholomew's Day Massacre in Paris. Later, he returned to England to take up the Puritan political cause, rebuking the Queen for considering a marriage to the Duke of Alencon (a brother of the Romanist French King) and working hard for a grand European Protestant alliance against the Roman Catholics. Meanwhile he became a patron of the arts. His essay The Defence of Poesy, which I'm going to review today, is now considered the greatest work of Elizabethan literary criticism in an age stuffed with literary giants. 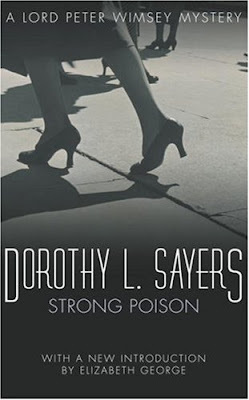 It is a defence of the art of fiction against its detractors; and I was interested to read it. Let me begin with a definition of "poesy", or poetry, since the definition is not quite what it is today. Sidney explains that he does not mean rhyme and verse, but fiction. Indeed, the scholar of ancient literature will soon realise that song and fiction were almost indistinguishable up until the Enlightenment. [I]t is not riming and versing that maketh a poet—no more than a long gown maketh an advocate, who, though he pleaded in armor, should be an advocate and no soldier—but it is that feigning notable images of virtues, vices, or what else, with that delightful teaching, which must be the right describing note to know a poet by. In response to some current literary objections to the art of fiction, Sidney set out to provide a legal-style defence of the art. Amazingly, most of the Elizabethan objections to fiction are the same as those made today; and much of Sidney's response still rings true, although I could wish it appealed more often to Scripture and less often to Homer and Virgil. For what else is the awaking his musical instruments, the often and free changing of persons, his notable prosopopoeias, when he maketh you, as it were, see God coming in His majesty, his telling of the beasts’ joyfulness and hills’ leaping, but a heavenly poesy, wherein almost he showeth himself a passionate lover of that unspeakable and everlasting beauty to be seen by the eyes of the mind, only cleared by faith? This alone, Sidney says, demonstrates that poetry "deserveth not to be scourged out of the church of God." Sidney then goes on to the Greeks, and demonstrates that the Greek word for a poet can be translated as "maker." Like Tolkien after him, Sidney argues for a subcreative right: as God created the world, so man may imitate his Creator, and subcreate new worlds. I'm a little suspicious of Sidney's reasoning here: he says that creation, or nature, is "brazen", while the creations of the poets are "golden." A similar problem crops up later, when he argues that fiction is better than history. Poesy, therefore, is an art of imitation, [...] that is to say, a representing, counterfeiting, or figuring forth; to speak metaphorically, a speaking picture, with this end,—to teach and delight. 1. Poetry written to praise God, such as the Psalms, the Song of Songs, and so on. And this poesy must be used by whosoever will follow St. James’ counsel in singing psalms when they are merry; and I know is used with the fruit of comfort by some, when, in sorrowful pangs of their death-bringing sins, they find the consolation of the never-leaving goodness. 2. Poetry dealing with philosophical, moral, or historical matters. For these, indeed, do merely make to imitate, and imitate both to delight and teach, and delight to move men to take that goodness in hand, which without delight they would fly as from a stranger; and teach to make them know that goodness whereunto they are moved:—which being the noblest scope to which ever any learning was directed, yet want there not idle tongues to bark at them. 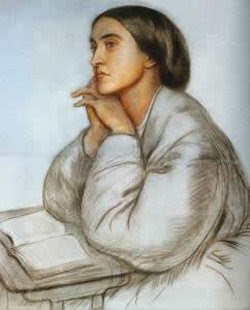 For Sidney, the primary use of fiction is to teach, and the aim of all teaching is "virtuous action". Therefore the question arises, is fiction useful for teaching virtuous action? Isn't moral philosophy a much better means of teaching? Or if we must have stories, what about the stories we find in history? Philosophy falls short because a man can describe a bird in flight, or Westminster Abbey, to you in hundreds and thousands of words without you getting an inkling of what he means; while if he were only to give you a picture of the thing he means, you could grasp it in an instant. "The poet is indeed the right popular philosopher," Sidney explains. His words "strike, pierce, possess the soul." Fiction has a power which nothing else can attain to. Certainly, even our Saviour Christ could as well have given the moral commonplaces of uncharitableness and humbleness as the divine narration of Dives and Lazarus; or of disobedience and mercy, as that heavenly discourse of the lost child and the gracious father; but that his thorough-searching wisdom knew the estate of Dives burning in hell, and of Lazarus in Abraham’s bosom, would more constantly, as it were, inhabit both the memory and judgment. History, too, Sidney says, falls short. And it falls short because history is not as "doctrinable" as fiction: in works of history, we must depict men as they are or were, but in fiction we are free to depict them as they should be. On the face of it, I agree with him--I think there's a great need for reading fodder designed to give people an ideal to live up to. Howard Pyle did just this sort of thing in his awfully good yarn, Men of Iron, and GA Henty did it in everything he wrote. Other authors write more flawed characters for the purpose of showing how that flaw can be addressed. Fiction, as opposed to history, does make the work of teaching through story easier, since if it is difficult to find a person who thoroughly embodies all the lessons we wish to teach, we can much more easily make him up--just as the prophet Nathan, in rebuking King David, was obliged to invent a rich man and a ewe lamb. However Sidney's argument becomes shakier as he alleges that historians can't show any reason behind the flow of events in their stories, but that too often in history we see good people punished and evil people promoted. This ignores the sovereign rule of Providence over history and makes the study of history futile. It's also a self-defeating argument. If we give history up and turn to fiction as the only place to see vice punished and virtue rewarded, then we may learn virtue, but we will have little reason to want to apply it to our lives if we are not trained to see Providence punishing vice and rewarding virtue throughout history. The argument scrambles onto firmer ground when Sidney states it in terms of our inability to say for sure what the meaning of a particular historical event is. However, Scripture gives us an interpretive lens for history and a reason to believe in Providence. The application most divinely true, but the discourse itself feigned; which made David (I speak of the second and instrumental cause) as in a glass to see his own filthiness, as that heavenly Psalm of Mercy well testifieth. I think it may be manifest that the poet, with that same hand of delight, doth draw the mind more effectually than any other art doth. And so a conclusion not unfitly ensueth: that as virtue is the most excellent resting-place for all wordly learning to make his end of, so poetry, being the most familiar to teach it, and most princely to move towards it, in the most excellent work is the most excellent workman. 1. That there are better ways to spend one's time. Sidney's answer is that there's nothing better one can do with one's time than to be moved to virtue by fiction, which is more powerful to do so than any other tool. 2. That poets are liars. Sidney replies that poets never pretend to be telling the truth, but plainly admit that they are spinning fictions. And therefore though he recount things not true, yet because he telleth them not for true he lieth not; without we will say that Nathan lied in his speech, before alleged, to David. Nay, truly, though I yield that poesy may not only be abused, but that being abused, by the reason of his sweet charming force, it can do more hurt than any other army of words, yet shall it be so far from concluding that the abuse should give reproach to the abused, that contrariwise it is a good reason, that whatsoever, being abused, doth most harm, being rightly used—and upon the right use each thing receiveth his title—doth most good. 4. That fiction diverts readers from real-world, gainful employment. Sidney, quite rightly, points out that all peoples in all times have had fiction, including many vigorous and enterprising societies, and adds that if this is an objection to fiction, then it must also be an objection to every kind of book-learning. 5. The fifth objection is that Plato intended to outlaw fiction in his Republic! This is very interesting--it shows the extent to which even the early Reformers (of the kind objecting to fiction) still leaned on pagan philosophers with repugnant ideas like Plato's. Sidney handily disposes of this objection by pointing out that Plato's objection to fiction was based on its use in his days to 'defame' the gods--a nice historical point, but not relevant enough to talk about here. Still, I think it's very interesting that the Great Authority called on in opposition to fiction is Plato, while the Great Authority upon whom Sidney calls in support of fiction is Our Lord. In conclusion, I found Sidney's The Defence of Poesy a really interesting discussion of some, but not all, of the questions surrounding the right uses of fiction. One rather amusing tid-bit was the historical detail that the ancient Romans used to play what's known today as "Bible roulette"--you know, the thing where you let the book flop open, and whatever verse you come up with is The Lord's Word To You For Today! Only, the ancient Romans played this game with Virgil's Aeneid, not with Scripture. Sidney calls it "a very vain and godless superstition"! Personally, I disagree with Sidney that fiction is the best way of teaching virtue. I entirely agree with him that it is a powerful and important tool for teaching virtue, but one simply cannot do away with moral philosophy either. The Lord Christ used both in His ministry on earth, from the moral philosophy contained in the Sermon on the Mount to the fictitious parables previously mentioned. Both are equally important, complementary, and indispensible.